I was reading in BBC news this week about the former boss of Ratners jewellers, Gerald Ratner, who managed to wipe £500 million from the value of his own jewellery group with one speech in 1991. He was maybe a tad too honest in an interview. He is reported as saying about his firm’s cut glass sherry decanters: “People say, ‘how can you sell this for such a low price?’ I say because it’s total cr**.” Needless to say, customers stayed away and the firm plunged into the red. So how do you check if the products that you are buying are good quality. With fingerprint jewellery it is vitally important that the raw materials being used are of the highest quality and that the artist creating your beloved memories is trained and skilful in their trade. Having cheap materials will undoubtedly mean that your memories will not last and you will be disappointed in years to come with the result. The fingerprint jewellery companies that we recommend only use high quality silver clay. There are only a limited number of suppliers for this clay in the UK and we make sure the keepsake companies in our directory buy their silver from these registered suppliers. 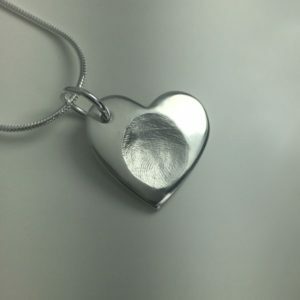 If you see an item of silver fingerprint jewellery for sale at a really cheap price it will probably be too good to be true. Silver is not cheap and no good business person will be selling their products at a loss – not matter how lovely they are! There is an old saying – buy cheap buy twice. But with something as special as capturing a fingerprint on a piece of jewellery, it is not something that can be replicated in years to come. To get good quality fingerprint jewellery at good prices and not cheap materials at cheap prices check out our directory of recommended artists here. You buy fingerprint jewellery to capture a memory. Keep that memory longer by buying high quality jewellery.